UFC light heavyweight and heavyweight champion Daniel Cormier has already successfully defended his heavyweight title in which he earned in July with a stunning first-round knockout victory over the defending king, Stipe Miocic. 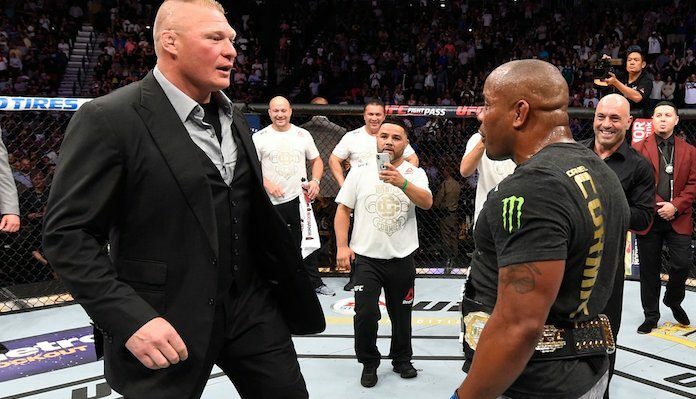 It seemed clear after that fight that Cormier’s first heavyweight title defense would come against another former heavyweight champion in the WWE star, Brock Lesnar. However, due to the madness that was UFC 230’s bout finalization, Cormier ended up headlining the card on short notice where he defended against Derrick ‘The Black Beast’ Lewis. A fight in which Cormier would win via second-round submission (rear-naked-choke). After the fight, Cormier made it clear that his sights were still set on Lesnar and according to Lesnar’s on-screen WWE manager and good friend, Paul Heyman, there’s no reason to believe that the fight won’t end up happening as he told TMZ. Lesnar currently holds the WWE’s top title, the Universal championship, and has only fought once since 2011. That time being at UFC 200 when he took on Mark Hunt. Cormier also fought at UFC 200 when he defeated Anderson Silva by way of unanimous decision. Since then the double champ has fought five times and gone 4-0 (1 NC) in the process. It’s likely that if Lesnar and Cormier do collide it will be Cormier’s last MMA fight of his career as he’s had a firm end date on when he wants to hang up the gloves which is March 20 when he turns 40 years old. Because of this, it gives Lesnar a small window to try and get the fight with DC in before he’s gone.